When half or more of your honeybees have deserted the hive and are lingering nearby, who ya gonna call? Swarm chasers can provide quick help to fellow beekeepers, keeping them from getting stung literally and financially. Swarming generally occurs because the colony is crowded, or it could be caused by genetics, Lewis said. “There is a predisposition in some bee strains that makes it more likely for them to do that,” he said. Sometimes, it’s simply a matter of a new queen pushing the old queen out. “The old queen would go with the swarm, taking half the existing colony and all the honey they can carry when they depart,” Lewis said. “A swarm generally flies a short distance and then hangs out on tree limbs, stop signs, the side of a house or perhaps in a playground. They’ll wait for the scouts to return and tell them where their new location will be,” Lewis said. The likelihood that a swarm can become a thriving feral bee colony depends primarily on where their new home is, Lewis said. Beekeepers can prevent losing a colony by dividing it ahead of time; by re-capturing the swarm cluster and placing it in a new hive; or by buying a honeybee variety known for its low tendency to swarm, Lewis said. If you’ve lost or simply spotted a swarm cluster, it may pay to find someone who, for a price or simply a new strain of honeybees, is willing to round them up. Dan Maxwell, a beekeeper from Freeland, Washington, frequently responds to calls requesting help to remove swarms. “I only work with honeybees,” Maxwell said. He won’t deal with swarms that have collected too high (15 feet or more) or that are enclosed in ceilings, crawl spaces and brickwork like fireplaces. Those cases are “too much work, and it can be messy with brood and honey,” he said. 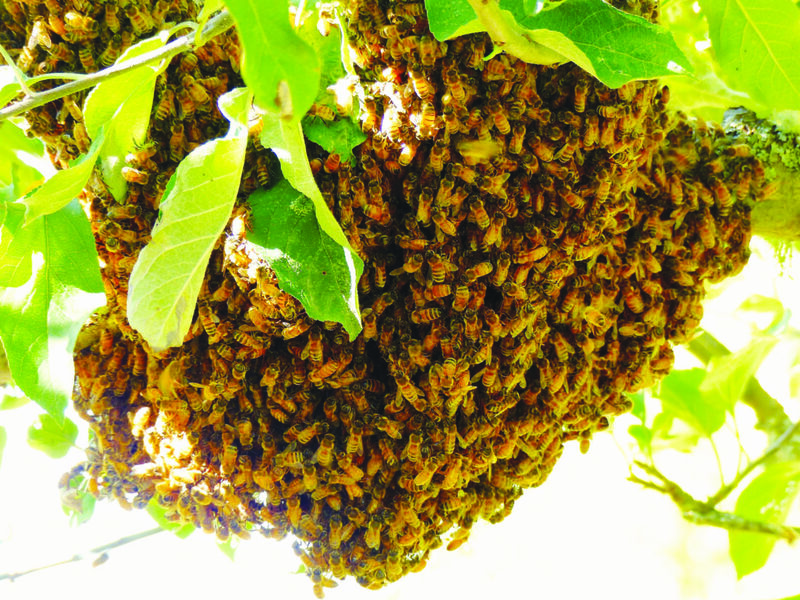 Swarm clusters on limbs or branches can easily be dropped or shaken into a box, Maxwell said. He often uses a vacuum with an adjustable suction setting that doesn’t harm the queen or worker bees. If you do see a swarm, don’t panic, throw rocks at it or spray it with an insecticide, Lewis said.